To maximize your chances of building a successful start-up, you should wait until your 42nd birthday to become an entrepreneur, advises a recent MIT study. Unsurprisingly, younger founders are often less experienced and consequently have a lower chance of success. Multiple factors play a role, including industry knowledge, human capital and access to financial resources. We spoke to 10 millennial founders after their first major funding round, in order to understand the critical factor that only comes with experience. The ability to recognize the need to pick up new skills as a business evolves is at the core of the transition from founder to CEO. 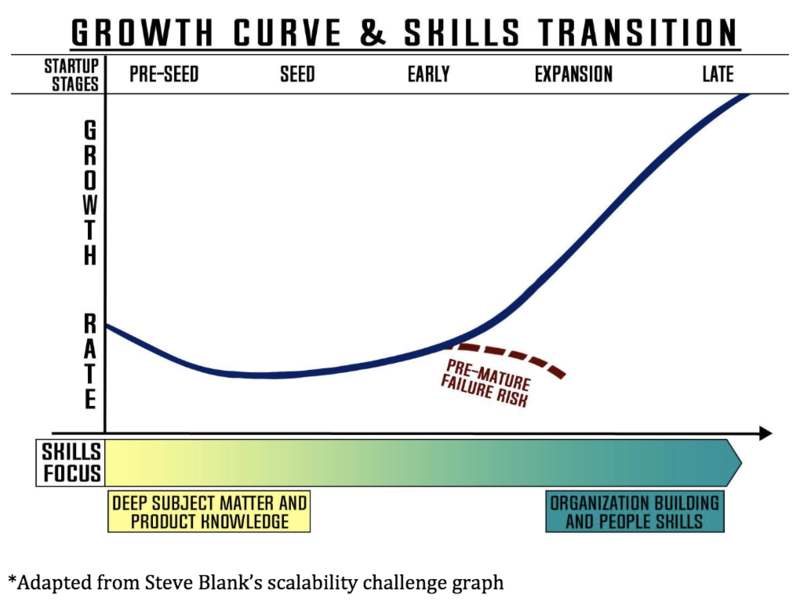 An unforgiving, high-stakes, high-pressure environment during the early stage of the scaling process tends to push less experienced founders to rely on skills that have proven successful in the past. A blind adherence to existing strengths is dangerous and often jeopardizes the future of a nascent promising start-up. A critical transition for the newly minted CEO is moving from product skills to people skills. A high-growth start-up leader needs to make themselves redundant in day-to-day operations and shift their focus to learning how to assemble a strong team, align their motivations and incentives, and build a thriving organizational culture. 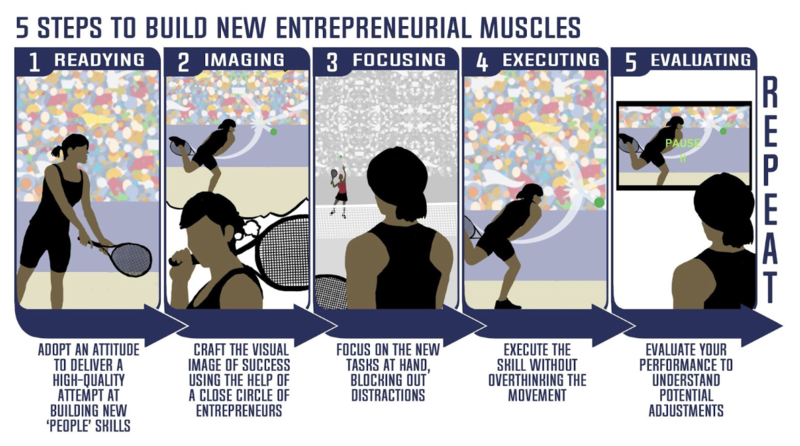 How can I build a new entrepreneurial skill set? Entrepreneurial capabilities largely stem from experience, and from learning that occurs in a stretch zone, beyond our comfort zone and before our panic zone. Reducing a vague and uncertain process to phased mechanic motions can help build an individual’s database of achievement and learnings. The following steps draw an analogy from Singer’s Five Steps Motor Learning Strategy. The first step in building new skills is recognizing the need for those skills. People tend to be invested in their present way of working, especially if it has been successful to that point. Most founders can build these new skills, as long as they are willing to take a step back and admit that their old habits have outlived their usefulness. Sly Lee, co-founder and CEO of Emerge, shares the point at which he understood what new skills he needed to acquire to continue growing his start-up: "Because we have such a high bar at our company in terms of talent, during some phases of the company my co-founders and I realized that almost 50% of our time was being spent on HR." Instead of picturing a scenario where a new employee makes frequent mistakes, the people expert imagines a situation where their team members exceed expectations. Crafting this image with the support of a network of other founders and then sharing it with the employee in question helps build confidence in both the founder and team members. The new employees are the ones who carry out the core deliverables and shape organizational culture. To increase the chances of success, founders need to give their team the same undivided attention they previously gave the company’s product. Mike Selden, co-founder and CEO of Finless Foods, understood the need to shift to using what he identifies as “soft skills, such as hiring and team and organization building”. In that process, he focused on developing his employees’ skills and aligning their motivations with the company’s objectives. Most founders struggle with relinquishing direct control of day-to-day operations. At first, letting go often takes more energy than doing it yourself, which creates an additional barrier to delegating. The challenge is to let go without overthinking, resisting the temptation to ‘help out’ and micromanage. Taking time out to reflect on improvements for the next try is essential. Understanding potential adjustments allows founders to continue on the path of perpetual improvement. Experience will continue to correlate positively with success. But innovation in the skills acquisition process can help younger founders build the needed skills agility to give the 42-year-old entrepreneur a run for their money. Maintaining awareness of the changing demands on core skills at different stages of the start-up journey, and tactically going through the steps needed to acquire new skills, can build the muscle memory needed to thrive in the long run. Thank you to founders mentioned in the article, and also to David Mou, co-founder of Valera Health; Vilas Dhar, social impact investor and entrepreneur; Jacob Skragge, co-founder of All Blues; Alan Ringvald, CEO at Relativity6; and Van Duesterberg, co-founder of Nutrigene.